Never being settled comes with the territory in the NFL, but the demands of constant relocation take a harder toll on NFL wives than you think. The midsummer sun shines on the red 49ers jerseys as the players practice at preseason camp in Santa Clara, Calif. Next to the field, near the weight room, the players’ and coaches’ wives and children sit on white folding chairs and watch in the shadows. 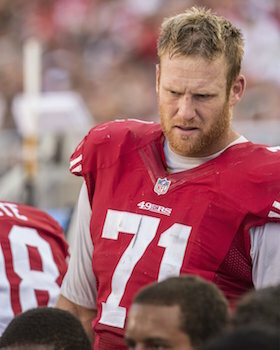 Almost a third of the players are new to the Niners. In a league where the average lifespan is 3.5 years, the threat of a career-ending injury is constant and few contracts are guaranteed, they’re under searing pressure to focus and perform. 10 of the team’s 14 coaches are also new. As the season goes on, their days will stretch deeper and deeper into the night. In other cities across the NFL, the demanding rituals of relocation are well-known to the families of players and coaches: contact the realtors, study the school systems, pick a community, find the new doctors, handle the kids’ emotions, shed an old life and start afresh. The teams help, but inevitably much of the burden falls to the wives and girlfriends and significant others. They’re the ones whose work every day allows Sundays to remain paramount for the pros. For the past two years, George Warhop has coached the offensive line of the Buccaneers. He and his family—his wife, Lori; son, Jacob; and daughter, Olivia—are settled and happy. Jacob, 17, is an aspiring artist who works mostly with pencil and charcoal. Olivia, 19, will be a freshman at Elon (N.C.) University in the fall and plans to double-major in business and marketing. But six years ago things were different for this family. They weren’t just difficult; they were touch and go. In May 2009, seven months after George was fired as the 49ers’ offensive line coach and three months after he took the same job with the Browns, Olivia started feeling pain in her left leg. George couldn’t help—he’d already relocated from Northern California to Ohio—so Lori contacted the 49ers’ trainer, Jeff Ferguson. He got Olivia immediately into Stanford Hospital, where a large tumor was discovered in her tibia. But Lori knew what was best for her family: She moved the kids to Ohio. Trainers and team doctors from the Browns connected Olivia with the Cleveland Clinic where Olivia received an eventual diagnosis of MyroFibrosarcoma, an extremely rare form of bone cancer. But her leg didn’t need to be amputated, and after a six-hour tibia resection, followed by a six-day hospital stay, followed by wheelchairs, crutches, rehab, three bone grafts, two plates along her tibia and 13 screws, she was declared cancer-free one year after the initial diagnosis. The summer Olivia was in the hospital, Lori spent every day with her. George, while coaching two-a-days, went to his daughter’s room at night and slept in a chair by her bed. Chanel Smith thought she was moving to San Francisco. Her husband, Torrey, who led the Ravens in almost every receiving category each of the past two seasons, signed a five-year, $40 million free-agent contract with the San Francisco 49ers in March. What Chanel didn’t know was that Torrey’s new team was based roughly 45 miles south of San Francisco, in Santa Clara. “I knew nothing about this area,” Chanel says. 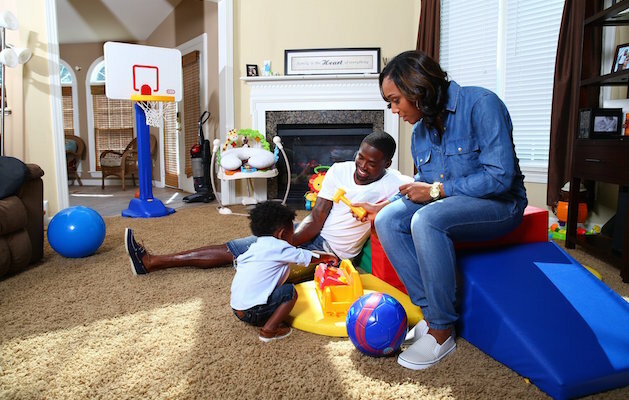 For two weeks after his signing, Torrey, 26, searched for a place in San Jose, just southeast of Santa Clara, while Chanel hung back in Baltimore with their one-year-old son, T.J. “I was kind of boycotting,” she says. “ ‘I’m just going to stay here, and we’ll come visit you.’ Typical overreacting response.” The Smiths’ house outside Baltimore was 4,800 square feet, with five bedrooms, a large playroom for T.J. and a 2 1/2-acre backyard. But for the monthly payments on its mortgage the Smiths could get only a small apartment in San Jose. “Torrey was O.K. with a little apartment,” says Chanel. “That’s great—but we have a baby. T.J. needs space to run around. And, coming from a house, I feel claustrophobic in an apartment. So we waited an extra week and got a three-bedroom townhouse." Sometimes the coach or player doesn’t have a wife. Or he does, but she lacks the prodigious energy or the organizational wizardry of Lori Warhop or Chanel Smith. He needs a savior. The Browns’ coaches call her Batman. They send out a signal—text, email, phone call—and she appears. Others call her Godmother. Her real name is Linda Musarra, and she’s a real-estate agent in Cleveland, where she specializes in helping professional athletes and coaches. For the single guys, she is also a de facto wife. From arranging homes and rental apartments to shopping for groceries and furniture, Musarra is her clients’ “go-to girl,” as she puts it. She can also be a companion, a mother or a therapist. “I try to become a confidant, a part of the family,” she says. “I’m the gal who, when you’re alone and things are going bad and you played lousy and you got hurt and you can’t cry in front of the coach, you pick up the phone and call me. It’s completely private.” After her clients get traded or fired or move elsewhere for another job, they still call her. When Musarra first meets a player or coach, she introduces him to her car. The car’s name is Vegas, and Vegas has rules. Vegas is a massive black Mercedes S550 (Musarra gets a new one every year) with leg room for a 7-footer in the passenger seat. Whatever is talked about in Vegas stays in Vegas. Also, there’s no swearing. “What if I say no?” the athlete asked. Besides Browns players, Musarra handles relocated Cavaliers and Indians. She found a house for first baseman Carlos Santana and his wife, Brittany. That four-story mansion sold for $1.2 million in 2009. About a year later Musarra got it for the Santanas for $361,000. “Are you crazy?” said Carlos. Marc Trestman felt a nudge. “Hey, check her out,” said his dad, Jerry. The two men were at a Cleveland clothing store called Hemisphere. It was 1989, 10 jobs ago for Marc, when he was the Browns’ offensive coordinator. He was talking to one of the young women behind the counter, but she was not the one Jerry had his eye on. He was checking out Cindy. Two years later Marc and Cindy got married. They were in Honolulu for the Pro Bowl, and, as Marc wrote in his 2010 book, Perseverance, “the tropical air took effect and I proposed.” They were wed one day later on the 16th hole of the Westin Kauai Lagoon golf course. The only guests were Mike Holmgren (then the 49ers’ offensive coordinator) and his wife, Kathy. The two couples were staying at the same hotel and had run into each other the morning before the wedding. • KAPLAN: How many NFL blunders will the owners tolerate? For Marc, the transition to a new city is easy. He works, exercises and eats at the team’s facility. When necessary he sleeps there. And when he walks into a new facility, he already knows people—someone he coached against, someone he worked with on another team, someone he met at the combine or the Senior Bowl. He has a built-in fraternity, an innate support group. Forget that. A free agent this off-season, Erik signed a two-year contract in March with San Francisco, his seventh pro team if you include a one-year stint with NFL Europe’s Cologne (Germany) Centurions. So it was time for the Pearses to pack up and move again, this time from Buffalo. No one knows exactly how tough it is better than Lori Warhop. Now 52, she still lives in Cleveland even though George, 53, moved to Tampa in 2014. Yes, they are still married. And yes, Olivia is still well. 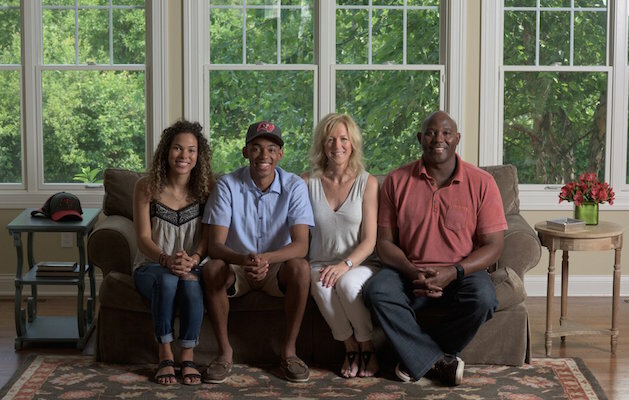 Lori and George simply didn’t want to move their two children while they were in high school—an arrangement that’s growing in popularity among NFL families facing similar situations. Jacob Warhop is a high school junior, and once he’s in college the plan is for Lori to join George wherever he’s coaching. “If she still likes me,” George jokes. One team’s resource pamphlet for families in transition details the club’s ticket policy and stadium information. It outlines the team’s travel arrangements and recommends area attractions, churches, fitness and health clubs, golf courses, grocery stores and hotels. There’s a little section on restaurants, hair salons, specialty shops, transportation, medical resources, household maintenance and preschool programs. That’s about it. Lori aims to do far more with her site. She’ll direct wives to the best schools, tutors, dentists, orthodontists, pediatricians and more in all 32 NFL cities—information she gathered from other coaches’ wives and from people she met during her odyssey through the game, including stops in college football and in NFL Europe. “I’m trying to make it as seamless as possible for families to move,” she says.